The first step toward developing an audience on YouTube is building a subscriber base. Subscribers are essentially “followers” of your YouTube channel. When a YouTube user subscribes to your channel, your new videos are placed on their YouTube home pages and they will receive email updates every time you upload a new one. Subscribers primarily matter because they provide consistent traffic to your videos. In addition to providing steady traffic, subscribers are likely to have a longer watch time and are more likely to engage with and share your videos because they’ve already shown an interest. So, you want to know how to increase YouTube subscribers for your channel? Here are strategies you can use to get them. To get more subscribers for your YouTube channel, you need to be consistent in uploading your videos. Posting one video and going dormant won’t get you subscribers. People subscribe to your channel so that they can keep up with your videos. When your upload videos consistently, people will come to expect more videos from you and they will see value in subscribing so that they’ll be automatically informed when you upload your next video. In addition to being consistent, you should ensure that your videos are original, informative or entertaining and always well edited. YouTube is the world’s second-largest search engine, with about 300 hours of video uploaded on the platform every minute. As such, getting found on the video-sharing service can be quite a challenge given all the competition. To get more YouTube subscribers from keyword searches, it’s important to research and find popular keywords that people are searching for. After that step, optimize your video titles and descriptions using these keywords. You can find popular keywords through YouTube’s auto-suggestions, doing a Google keyword search, checking YouTube Trends and by getting search volume data from Google’s Keyword Planner. Optimizing your video titles and descriptions with keywords will help lead people to your videos through YouTube and Google. It will also help the YouTube algorithms to link your videos in the Suggested Videos section. Channel art is what establishes your YouTube identity. It’s what gives your page a distinct look and feel and helps attract viewers. Make sure your channel art is appealing to visitors. It creates the visitors’ first impression and many will make a subconscious judgments based on what they find here. This matters a lot because it can mean the difference between getting a new subscriber and fading into oblivion. Since you have viewers watching your videos from various platforms, make sure that your channel art is optimized for different devices, whether it is viewed on a desktop, a laptop, a television, a mobile phone or a tablet. Use design principles when coming up with your channel art or hire a professional to make sure that everything is visually pleasing. YouTube annotations are a great way of getting viewers to subscribe to your channel. Annotations make your videos interactive by acting as a Call To Action that drives your viewers to perform a certain action. Annotations can be used to help your viewers find your other videos, making them more interested in your channel’s content and thus more likely to subscribe. In addition to finding your other videos, annotations can be used to directly urge your viewers to subscribe to your channel, leave a comment or follow you on Facebook or Twitter. While annotations might be annoying for users if used too much, tasteful use will serve to drive traffic to your other videos and increase your subscriber count. When using annotations, care should be taken to ensure that they do not interfere with viewer experience. One of the most straightforward and effective ways of getting people to subscribe to your channel is by asking them to do so. You can do this through a number of ways. You can ask them directly either at the beginning or at the end of your video. You can also include an annotated link that users can easily click to subscribe to the video. Apart from YouTube, you can use other platforms to ask people to subscribe to your channel. Share a link to your YouTube channel on your other social media pages and ask your followers to subscribe. If you have a website or blog, add a YouTube widget and urge your visitors to follow you. You should also include a YouTube icon with a link to your channel as part of your email signature line. One of the best ways to increase YouTube subscribers is simply buying them. You may have heard that buying fake subscribers won’t help you achieve your goals, but that’s actually not quite the case. 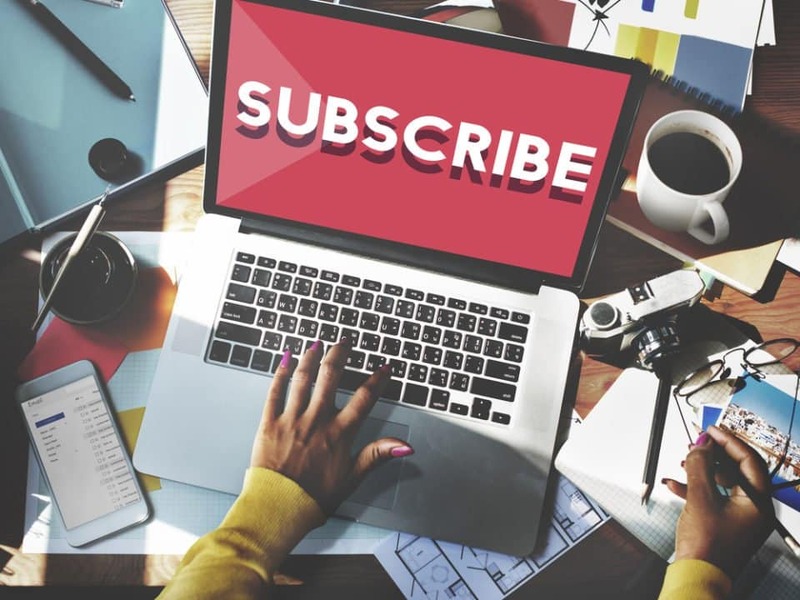 You can think of buying subscribers as a bit of a trick or a shortcut that will help you build a subscriber base faster than if you would go about it the natural way. Generally, people assume that a channel with a high number of subscribers is more interesting and relevant than a channel with zero or only a handful of subscribers. Why else would so many people subscribe to the channel? Therefore, buying subscribers is a way of fooling the system. When you buy subscribers, people will see your high subscriber count and it will change their perception of your channel. They will assume your channel is interesting and they will jump onto the bandwagon and subscribe as well. However, when you buy subscribers, you have they aren’t real and the real idea is to help attract real subscribers. This means that buying subscribers can’t be used along, but rather alongside the strategies listed above. Interested in finding trusted sources for buying YouTube views? Don’t miss our reviews of the top 5 companies where to buy YouTube views. Thanks for sharing these helpful ideas for increasing views, they helped me a lot. These tricks helped me huge popularity on youtube, please keep sharing such more helpful tips and tricks for generating traffic on youtube. To get a custom-made app for your youtube channel, try youtube monetization which is an amazing platform to increase viewers and subscribers on youtube and earn money. youtube monetization, which allows you to make your own app of your youtube channel to help you create more visibility over the internet and quickly start making more money from your work. Interesting and helpful article. Thanx for sharing this information… Youtube Monetization is one of the tested ways to earn rapidly through youtube videos, please check it out, it is amazing. This article is indeed very helpful! Even if your YouTube channel or video ideas are extraordinary but you don’t have a strategy it’ll be nothing. Thank you for these tips! I’ll try to apply these and see the result on my own. Big thumbs up to you!